Not only you will be able to generate the basic meta like title, descriptions and keywords, but also image titles and alts and your H1 for categories, products and more. Once you have generated for all, go ahead and customise by page. Everything is multilanguage, so you can setup your generator template separately for each language. You can customise per product, category etc and tweak it as you need. It's that flexible. You will also get a SEO module Meta widget on your Dashboard. It a great way to see how your doing, keep trek of you meta status and react accordingly. Access the important information immediately as you enter your store admin. Once you define the template, the module will create all the meta for you when you create a new product, category, manufacturer or information. Because we have developed our ecosystem using opencart even system and without using vqmod in the frontend, we have avoided most of the theme conflicts. So you can use it safely with different themes, as long as you follow the setup instructions. But hey, we can help you with that. What are Meta tags for Opencart? Meta tags are short code snippets in your Html head that help search engines better understand the context of your web page. Of course, Google, Bing and Yahoo view your page as a whole and never judge only by what you write in your meta tags, but still event today some of the meta tags are quite important. Yet, some aren't and even bad for you. Opencart from the start had some basic Meta tags available in the admin panel which is a good start for any SEO Expert. Yet, it lacked many of which are now by default necessary for successful SEO. Using Opencart SEO Module infrastructure you can implem all of the most popular SEO Meta Tags and even extend them to your needs with a bit of coding. What SEO Meta tags in opencart are Important? The Title tag is one of the oldest and still play a large part in SEO. Although some SEO Experts claim that google has reduced the importance of the title tag and the keywords placement, from the looks of it - it is still one of the 5 top major factors in SEO. The Description tag is a tag the is not taken into account by the search engines ranking mechanism, but still plays a very important role in CTR (click through rate) which eventually influences you position in the search results. Keywords tag - once one of the key tags in SEO, is now one of the worst tags you can use for SEO. It is completely ignored by Search engines but is a perfect tag for your competitors to learn your SEO strategy. If you have Keywords - keep them empty. Robots tag - one of the most important tags that you should take into consideration today. It allows you to set ground rules for any search crawler to index or not to index your page. You can of course use robots.txt together with this tag. By specifying which page should be omitted, you are removing low quality pages from google index. Viewport tag - it doesn’t take part in the search ranking results, yet missing out on it can lead to issues in mobile view, which increase bounce rate and harms your SEO. Opencart has viewport, yet it is lacking robots. And although the robots tag is not a must, it is a great tool to properly setup your juice flow. But now all Meta tags are good. We have already spoken about the keywords meta tag, which is not only ignored by search engines, but it is also a perfect giveaway for you competitors. Author - This was one of those old tags that just doesn’t make any difference, and frankly - a waste of code space. Expiration/date tells the bot when the page will expire, but since you don’t plan on having you page ever expire, just avoid this tag. Cache control is used to tell the browser when and how to cache your website, but it is not a good option, since no all proxy servers even look at them, making these tags useless. It is best to use HTTP headers. How can Opencart SEO Module Meta help? 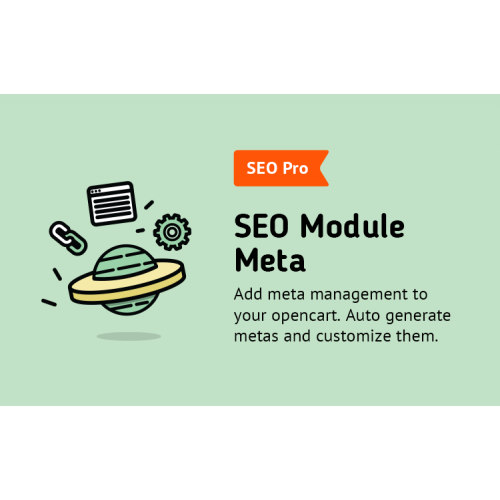 SEO Module Meta is part of the SEO Module ecosystem, using its API to interact with other SEO Modules and opencart. This allows you to have a robust SEO module, that does not create conflicts and is expandable to meet any custom needs. Its multi-language, multi-store and more. It works perfectly with Opencart SEO Module Manager, allowing you to edit and export/import to excel all the Meta tags. Sou you can manage them all from one place. Another great extensions it works together with is the SEO Module Adviser and the front toolbar, allowing you to keep an eye on the consistency of your Meta tags 24/7. Here are some great tips you should learn when writing your meta tags. Title tag is one of the most important - keep it less than 60 characters and add a keyword in the beginning. Do not do keyword stuffing in your Title - it doesn’t work. Just one main keyword is enough. Don’t fill in the keywords tag. Leave it empty. Write good descriptions 155 characters long. Add keywords to the description that you are targeting, but also try to make it appealing. The keywords will highlight and attract the viewers attention while the context of the description will increase your chances of a click. Include a call to action in your Description. Make it stand out. Don’t include double quotation marks - they are treated badly by aggregators. Take control of you robots tag. Hide low quality pages from being indexed. Add microdata and social tags - will better present your link on other platforms and increase your chances of a click.